Q. 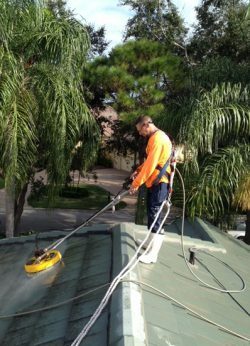 Is Roof-A-Cide® Treatment a safe roof cleaning, eco-friendly product? A. Yes. Since 1992, Roof-A-Cide® isThe Only EPA Registered and Roofing Manufacturer Approved Algaecide specifically formulated for roofs. A safe eco-friendly product, that is cost effective and helps to lengthen the service life of the roof. Guaranteed to Prevent recurring algae growth, mold, mildew, fungus and stains. Eliminates the costly cycle of frequent chlorine/chemical high pressure cleaning methods. Contact us for EPA Registration#. Q. Do the black stains I see hurt my shingles? Q. 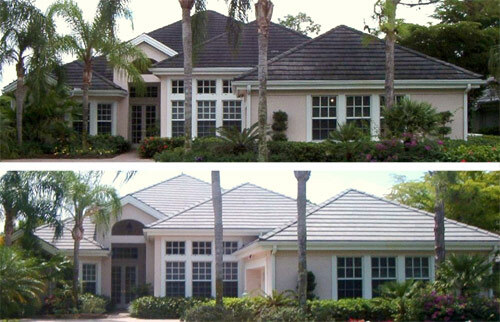 What type of roofs can Roof-A-Cide® Treatment be applied to? A. Roof-A-Cide® Treatment is major roofing manufacturer approved for use on Asphalt Shingle, Shingle Steel, Concrete, Clay, Barrel/flat Tile, Stone coated steel and Slate Roofs. Safe for People, Pets and Plants. Q. How does Roof-A-Cide® Treatment protect my roof from algae, mold and ugly black stains? A. Roof-A-Cide® Treatment is lightly sprayed on a dry roof, chemically bonding to the roof, preventing airborne algae spores which land on the roof from forming colonies and causing black stains. NO rinsing, the roof is now protected. Eliminates the costly cycle of frequent chlorine/chemical roof cleanings. An Asphalt Shingle or Stone coated steel roof is gently cleaned one last time, with Roof Restore® Cleaner and rinsed clean with only water. A slate, concrete, clay barrel or flat tile roof is cleaned only with water. Q. Can Roof-A-Cide® Algae/Stain Treatment be applied without walking on the roof? A. 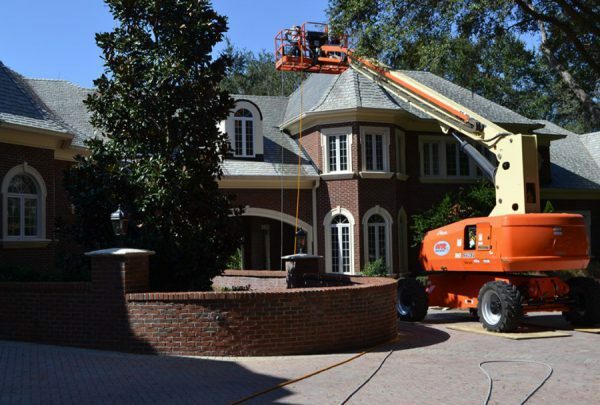 Yes, Roof-A-Cide® Algae/Stain Treatment is safely applied by our applicators trained technicians with a fine mist spray from a ladder, bucket or boom work platform. New – Community UAV Drone service in Naples, FL. Q. Does the roof need to be cleaned before a Roof-A-Cide® Algae/stain Treatment? A. A final cleaning is recommended for best results. Over time roofs become infected by wind driven Algae spores, which land on roof and quickly form colonies, mold and black stains. Note:Roof-A-Cide® Treatment may be applied without cleaning to a roof installed within the last year. 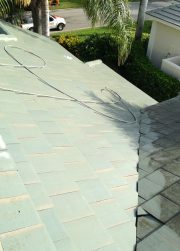 Roof-A-Cide West, shingle before and after. Safe Roof cleaning and Treatment. Q. Will a Roof-A-Cide® Treatment cancel my roofing manufacturer warranty? A. NO. Roof-A-Cide® Algae/Stain Treatment is Tested and Approved safe for use by major roofing manufacturers; GAF, TruSlate, PolyGlass, MonierLifeTile, US Tile, CertainTeed, Crown, Elk, Entegra, Boral, Metro Roof Products and Gerard Roofing (Boral) Stone Coated Steel. Q. Can our community treat black mold on walkways and golf cart pathways? A. Yes. Cleaning and application of Roof-A-Cide® products can safely control mold and mildew on unsealed concrete and brick surfaces; driveways, curbs, pavers, common areas, walkways and golf cart pathways. Q. My community had “algae resistant” shingle roofs installed, many of the roofs now have algae, mold, mildew and black stains. Can they be cleaned? Q. Does Roof-A-Cide® Algae/Stain treatment contain toxic or corrosive chemicals? A. NO. Roof-A-Cide® Algae/Stain Treatment is safe and does not contain toxic or corrosive chemicals. Q. What is no pressure, no rinsing, bio-gel, soft chemical roof cleaning? A. No Pressure, Soft Chemical roof cleaning, is a Toxic Chlorine and other chemical mixture, no rinse method. Also known as; Certified, Soft Washing, Foam, Bio-gel, Biocide, Non pressure or No pressure roof cleaning. Runoff will kill plants and shrubs. Chemical cleaning contractors use toxic corrosive mixtures; DIY Fruit scented, citrus, fruit sauce cleaner mixes; Pool Chlorine, Ammonia, Sodium Hypochlorite or Sodium Hydroxide(Lye). The toxic chemical cleaner mixture is left on roof, not rinsed off. Expect temporary results. Not a safe, cost-effective long term solution. Unfortunately, harsh chemical roof cleaning contractors are virtually unregulated. Many are unlicensed or uninsured. Chlorine Bleach is Corrosive and should not be used for roof cleaning. Especially, when used in high strength (50 – 90%) concentrations throughout Florida. Chlorine Bleach should always be rinsed off to avoid damage to the roof. Requires repeating the process, in 6-12 months depending on where you live. NO written warranty. Not eco or plant friendly. All plants and shrubs must kept wet during and after cleaning. Harsh Chemical Soft Washing methods will dry out the roof prematurely and shorten it’s service life. Pest control service products applied are neutralized. Q. What is a biocide roof cleaner? A. Biocide or foaming disinfectant cleaners are common and typically used in food processing/handling equipment and other industrial applications have found their way to your roof. OTC (Home and Hardware stores) cleaning products are sold as; biocides, bio cleaners, bio foams, bio blockers, cationic surfactant no rinse methods and other citrus odor/color cleaners. QUATS – (Quarternary Ammonium Compounds). Ex: alkyl dimethyl benzyl ammonium chloride or a Cationic Surfactant Ex: alkyl benzene ammonium chloride. Safer for your roof than Chlorine, but, not EPA Approved. Runoff kills plants and shrubs. QUATS and Cationic Surfactant cleaning products are sprayed on the roof, not rinsed and will require 3-6 months and adequate rainfall to see results. Ex: alkyl benzene ammonium chloride. Follow up cleanings are an additional cost and a frequent disruption to your community. Cleaning with Quaternary Ammonium Compounds requires repeating the process in 3 – 6 months depending on where you live.This is NOT a cost-effective, long term solution. FACT: Bleach and TSP (Tri sodium phosphate) will corrode metal (even in weak concentrations) and High-Strength Chlorine Bleach (Pool Chlorine) will accelerate the damage – especially when the roof is not rinsed properly. FACT: No Roofing Manufacturer in the US recommends the High-Strength Chlorine Bleach solutions that are applied and left on roof all over Florida and increasingly throughout the US. Click on the link below for an independent article on proper roof cleaning. Improper Roof Cleaning Can Reduce Service Life page 24 and 25.